The commander of U.S. Strategic Command is reorganizing to improve its warfighting structure. 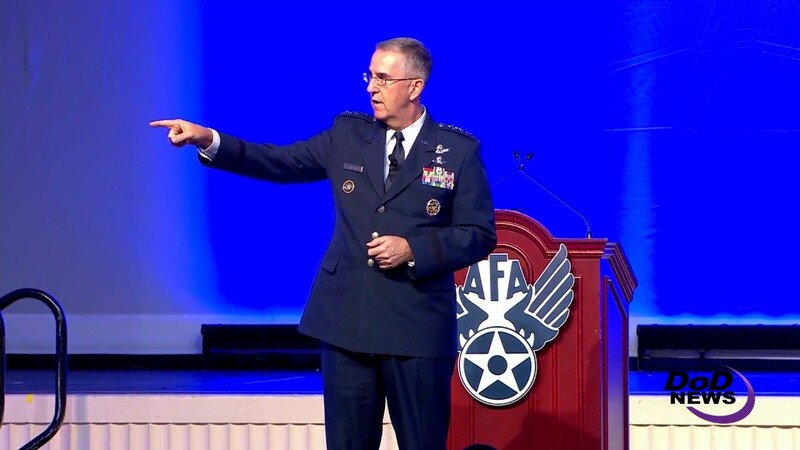 Air Force Gen. John E. Hyten told the Air Force Association's Air, Space and Cyber Conference recently that he recognized there was an organizational mismatch on Nov. 3, the day he took command. He signed out the implementation order in June, and the new air component went live yesterday. "Even though we're listed as a functional combatant command in the Unified Command Plan," Hyten told the audience, "Stratcom is the ultimate warfighting command. It is our nation's ultimate power. And it is a warfighting command from beginning to end." The first time he sat down in the Dougherty Conference Center at Offutt Air Force Base, Nebraska, to meet with his commanders, Hyten said, he saw that the two- and three-star commanders had a speaking role, but not the four-star commanders at the table. That, Hyten said, was because the four-stars were not operational components to Stratcom. Instead, the two- and three-stars were commanders of operational Stratcom components, and they all also worked for the four-stars. "So I just asked myself, why aren’t they [the four stars] the components, and I’ll just ask them and they can reach out to the guys that already work for them and fix the problem?'" Hyten said he thought at the time. " … How come we aren't organized as a warfighting command?" Hyten said the only integration happening at Stratcom at the time was in his office. "Our mission is to provide tailored nuclear, space, cyber, global strike, electronic warfare, missile defense and intelligence capabilities. That's what the UCP tells us to do, and we do that. But today we do every one of those in its own stovepipe. Even nuclear and global strike, in many cases, are stovepiped off each other," the general said. "So the vision of my command is one team, one warfighting team, innovative and joint, providing the integrated multidomain combat capabilities that we need as a nation." -- A Joint Functional Component Command for Integrated Missile Defense, or JFCC IMD. Maguire said the plan identifies Air Force Global Strike Command's commander as the JFACC, Air Force Space Command's commander as the JFSCC, and the commander of U.S. Fleet Forces Command as the JFMCC. Maguire also said JFCC IMD, one of the legacy structures from the previous organization of Stratcom, will remain until the conclusion of the Ballistic Missile Defense Review. Upon conclusion of the review, JFCC IMD will be restructured if and as directed. U.S. Army Space and Missile Defense Command/Army Forces Strategic Command commander will retain command JFCC IMD. Standup of the JFACC, JFSCC and JFMCC, and their assumption of the Nuclear Task Force/Joint Functional Component Command roles and responsibilities is a phased process, Maguire said, to make sure Stratcom has identified and can work through issues while maintaining command and control of the nation's strategic forces. As the JFACC reached initial operating capability Sept. 30, Maguire said, Gen. Robin Rand, as AFGSC commander, will be responsible to Hyten for recommending proper use of assigned and joint attached air forces, and will make those forces available for tasking. He will also plan and coordinate air operations, Maguire said. Forces available to Rand previously fell under Task Force 204, strategic bomber and reconnaissance aircraft; Task Force 214, land-based intercontinental ballistic missiles; and Task Force 294, aerial refueling tankers, Maguire added. No initial operating capability dates are available yet for the JFSCC or JFMCC, he said, but space forces available to the JFSCC are those that now belong to the Joint Functional Component Command for Space. Maguire said Stratcom did not require congressional approval to conduct the restructure, but has kept Congress informed as the restructure has been approved and implemented. "As General Hyten previously said," the major noted, "this restructure is part of a larger effort to make sure everybody who works in U.S. Stratcom understands it's a warfighting command with a normal structure familiar to all military personnel." With the establishment of the JFACC and the future establishment of JFSCC and JFMCC, the command will have a warfighting construct, he added. "That is the way we organize for warfighting," Hyten said at the Air, Space and Cyber Conference, "and if you're in a warfighting command, that's how you should be organized, and that's the way we're going to go."